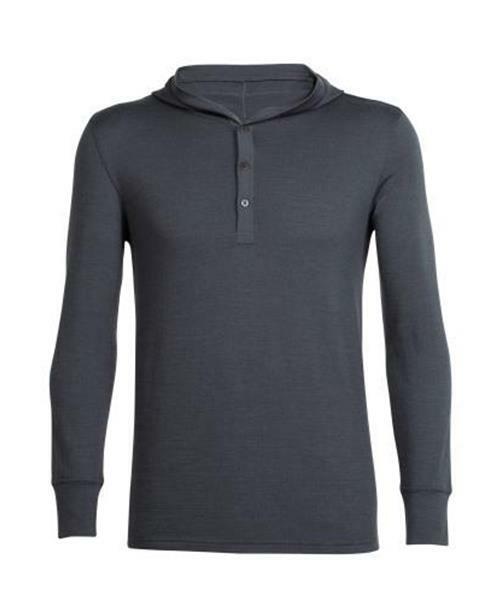 Trailhead Pullover Hoody - Mens is rated 4.8 out of 5 by 14. Rated 5 out of 5 by Billy13 from Jay Peak When I hike the mountain this is my go to hoody. It's so light you don't know you have it on. Warm and comfortable, Icebreaker makes quality clothing. Rated 5 out of 5 by FlyingVee1557 from Great hoody Very comfortable and warm of after trail runs on the North Shore. The three buttons make it much easier to take off compared to a regular pullover. Will most likely pick up another on in a different colour. Rated 5 out of 5 by PJS1066 from Looks Good and Excellent for Layering The title pretty well sums it up. I wear it all the time and its light weight allows me (as I am right now) put a Tshirt over it for a bit more warmth in the summer and just wear it as is indoors. The hoodie is more of a decoration as it does not "tie" down, but its thin enough to wear under a bike helmet. Rated 4 out of 5 by 1BigTicket from Let your husband buy his own clothes... Great looking shirt. Could easily be worn for a casual day at work or out for dinner. Great fit and sizing. Only negative is my husband felt it was itchy compared to his other icebreakers. Ultimately returned and purchased another cool lite icebreaker shirt he loves. Otherwise a typically great product! Rated 5 out of 5 by klarap from great looking hoody I bought this hoody for my son-in-law - a tall ( 6'4") slim guy. The large fit him perfectly. Long enough on the sleeves, comfortable length and not baggy. He liked the fit. A great addition to the other icebreaker pieces I have bought for him. Rated 4 out of 5 by Letitsnow from Cozy All Purpose Hoody The hoody fits a little large in comparison to a lot of my other icebreaker items. A little time in the warm dryer, took care of the slight adjustment needed. Overall a comfy hoody that's good for many activities. Rated 5 out of 5 by happyhubby from Another great product I've been using Icebreaker for several years and this hoody has been another great product so far, especially in the -30 weather we've been having in Alberta lately.